Every item that is ordered is displayed in a stylish complementary gift box with the pa-pa designer jewellery logo printed on it. Designs registered with the UK Intellectual Property Office, Newport. 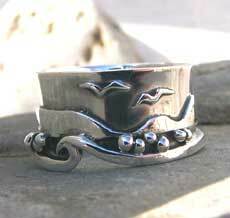 This solid silver ringis inspired by the breathtaking view of Worms Head on the Gower Coast, South Wales. The bay is strewn with seashells and starfish after the waves of the Bristol Channel crashing along its shore on a big swell. The distinctive landscape is featured along with seagulls, pebbles and wave on this 10mm wide ring. Other design options are available, email [email protected] with your own idea for a personalised piece.